Who Are We? - We are the largest fiberglass pool installer in the area. We have installed over 450 pools throughout Savannah, Pooler, Rincon, Richmond Hill, Bluffton, and Hilton Head. We were named "Best Pool Company" in 2009 by Savannah Magazine. One thing that makes us different is having the best products from which to choose. 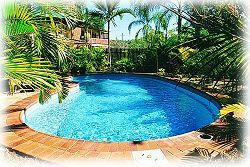 Because we were one of the first to establish the fiberglass pool market, we proudly sell and install Barrier Reef Pools (manufactured fiberglass) as well as custom Gunnite Pools. First-time pool owners appreciate our new retail store which offers weekly pool school class. Customer service is our greatest asset. Word-of-mouth is our best method of advertising. We'd be happy to provide you with over 450 references! Why Buy a Fiberglass Pool? - Your fiberglass pool can be installed in as little as two weeks. Weather conditions usually won't hold up installation. The pool shell arrives on-site pre-formed, complete and weatherproof. An impervious pigmented surface finish called "gelcoat" is applied during manufacturing. So you don't have to spend time and money tiling, etc. Under normal conditions, the "gelcoat" finish never needs painting. Its smooth inert surface cleans easily, resists stains and requires less chemical saving you $$$ and giving you more time to enjoy! Unlike some other materials, a fiberglass pool is not abrasive, and there are no sharp, dangerous edges. Salt water pools are becoming increasingly popular for their healthy, natural feel. Fiberglass is the material that is most compatible with salt water. 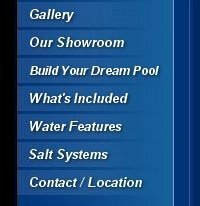 The pool style you select in the display center or brochure is exactly what you get at home. No hit or miss guesswork. Unlike concrete and other pre-formed pools, our fully-molded, one piece, 100% fiberglass pool shell flexes without cracking. Fiberglass pools come in a fantastic range of new colors, shapes, sizes and designs. Copyright © 2007-2010 by InterWeb Designs, Inc. All rights reserved.